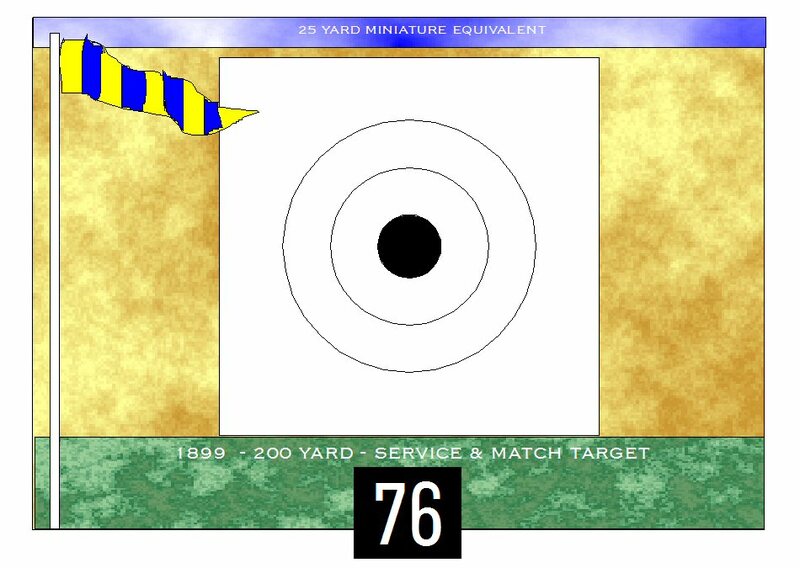 Below is the Cadets and Schools 25 yard target as used in the Miniature Winter League - Veteran Class. Two shots are put on each diagram. 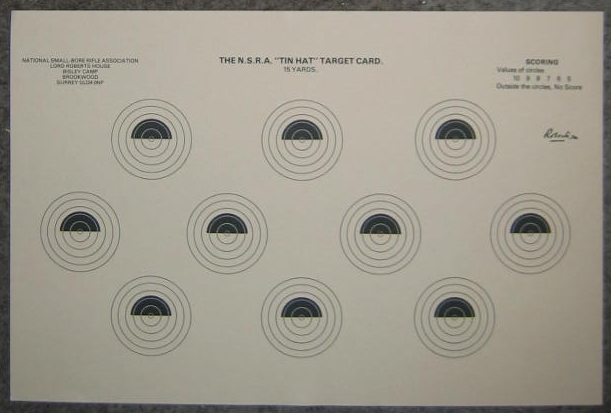 The 15 yard target is the same layout of five diagrams, but inverted, with two at the top and three at the bottom. The inward gauging OUTSIDE diameters of the bull for 25 and 15 yards respectively are 0.380 inches and 0.105. inches. 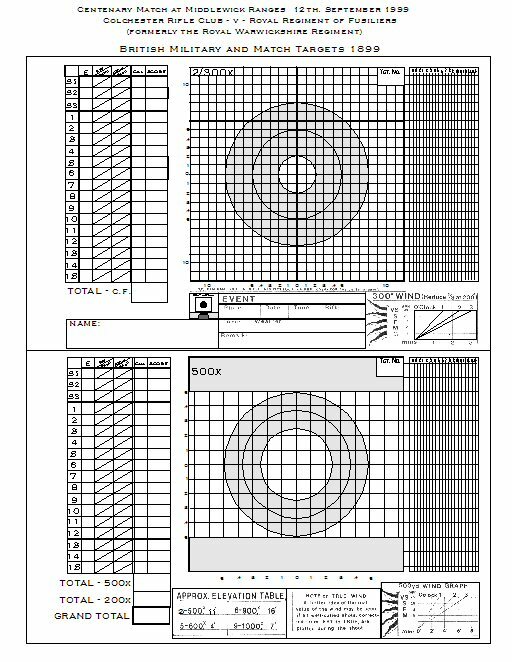 On these inward gauging targets, moving inwards, each white scoring line must be touched or broken into to score the higher figure. Below are the Tinhat TARGETS used in the Miniature Winter League - Service and Classic Classes. 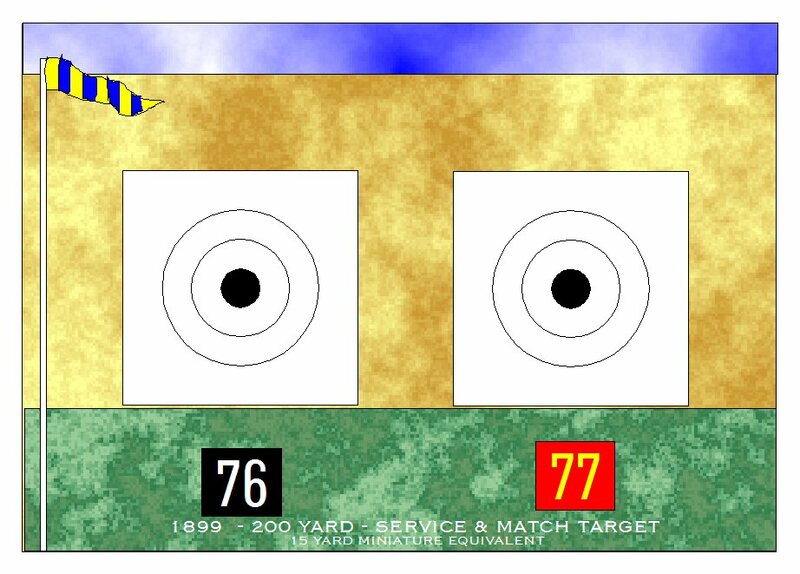 The 25 yard card has five diagrams, as the Cadets & Schools, and again two shots are put on each diagram. The diameter of the black on this target is 1.54 inches at 25 yards and 0.84 inches at 15 yards. Note that there is an X-ring or "Carton" only on the 25 yard target. Below is the Skirmisher target as used in the Miniature Winter League - Veteran and Post-Veteran Classes. The "deliberate" card for the Post-Veteran class is the familiar and current 1989 N.S.R.A. target shown below. The outward gauging INSIDE diameters of the bull for 25 and 15 yards respectively are 0.496 inches and 0.965 inches. 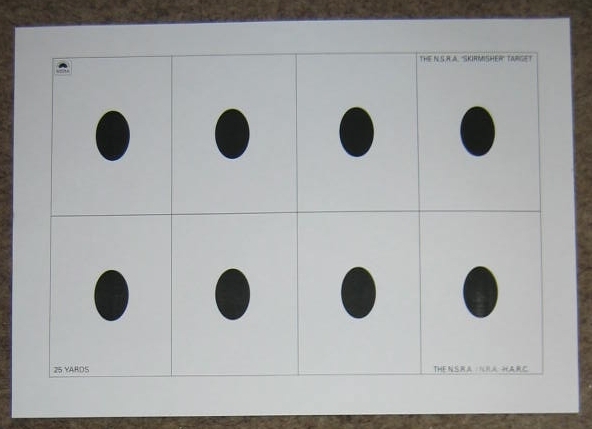 Moving outwrads, each white scoring line requires to be broken through to the next lowest scoring ring black before the lower figure is scored. 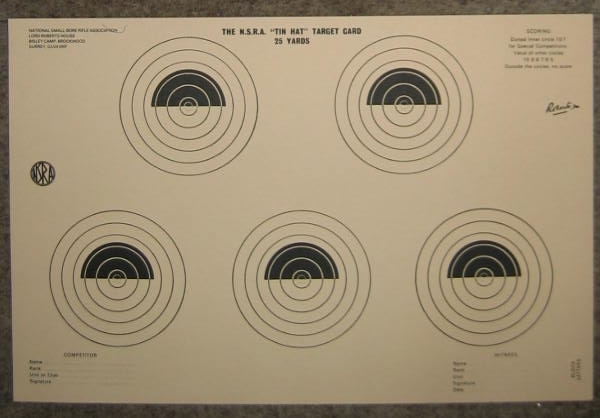 In the HARC Historic Miniature Rifle Winter Standing League, the "Tin Hat" target is used at 25 yards in all three classes. Dorchester has a good stock of these; the current price (2018-19) is £13 per hundred including postage and, when ordering, cheques should be made payable to "Dorchester Rifle & Pistol Club". 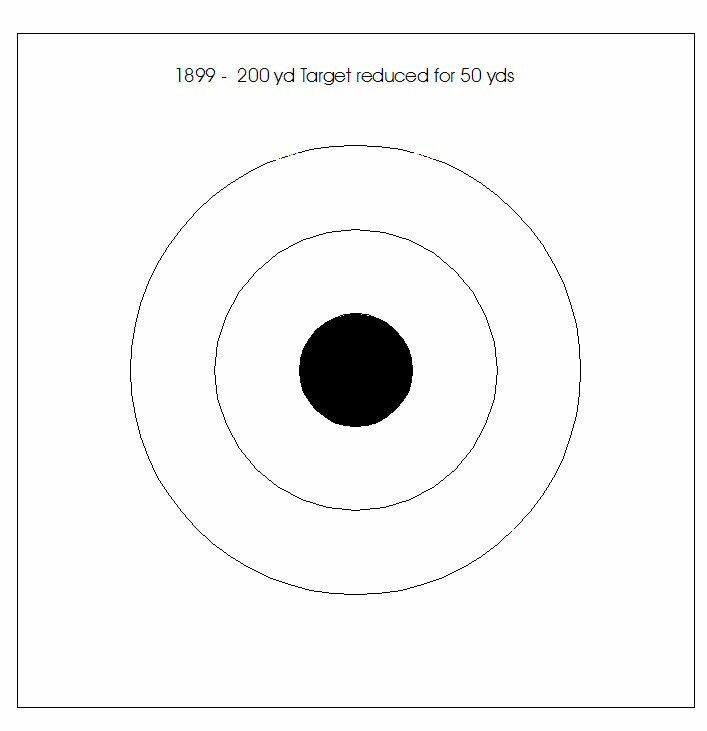 The diameter of the black on both American targets shown below is 3.875 inches for use at 25 yards offhand (standing) and 50 yards prone. The inside diameter of the bull (not the X-ring or "Carton") is 0.9 inches. The above "Tin Hat" target is used for all three Winter League Standing classes. 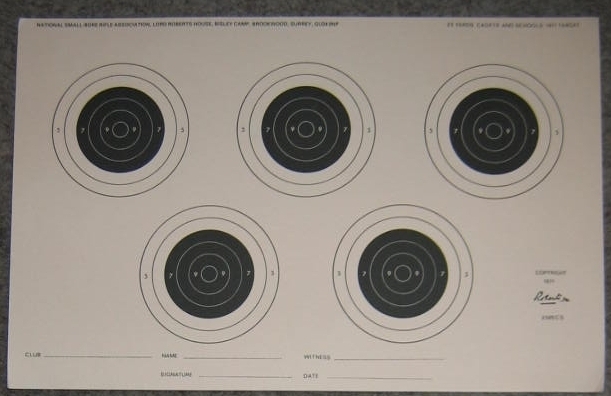 They have one more scoring ring than the full round black target previously used ( shown below for DRPC Summer League use) and will permit better scores. N.B. 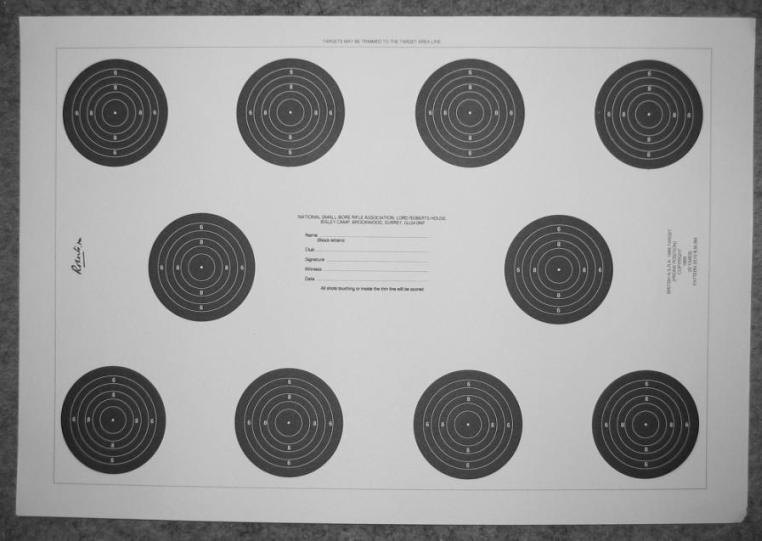 If you wish to shoot on these at 15 or 20 yards, then acquire a target and photocopy reduce it onto suitable paper. In all other respects, the standing competition is the same as the prone; i.e., Shooting dates, match system, scoring, etc. where r = original radius to be reduced or increased, and 0.11 is half the diameter of a .22 bullet. For example, to reduce the a diameter from 25 yards to 20 yards range ~ diameter "x", where the original diameter at 25 yards is 3.875 inches, making its radius half that at 1.9375 inches.